Curated email newsletters allow you to build thought leadership and stay top-of-mind with your customers. 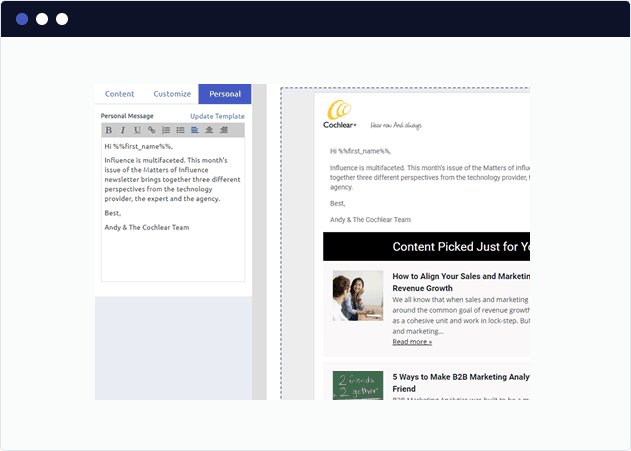 Drag and drop content items to craft the perfect email in seconds. Supports video content from YouTube or Vimeo. Include social posts from Instagram, Twitter, or other social sources. With the FeedOtter bookmark you can instantly save any webpage to FeedOtter for use in a curated newsletter. Add your favorite blog and news websites, YouTube channels to easily drag-and-drop content into your curated newsletters. You can also bookmark content from any website directly to your FeedOtter account with our Content Bookmark feature. 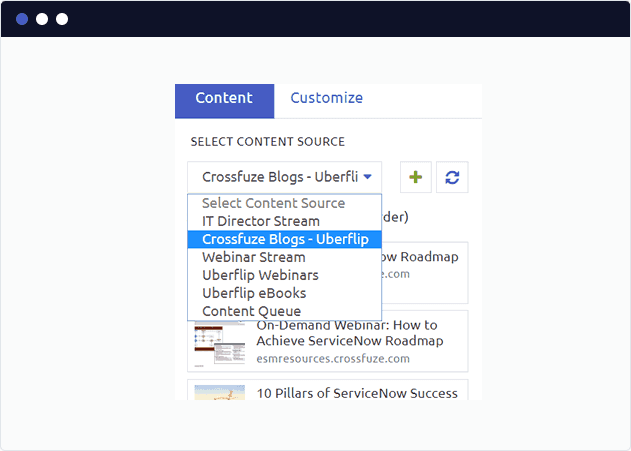 We also feature integrations with UberFlip and Newscred for direct access to your content streams. 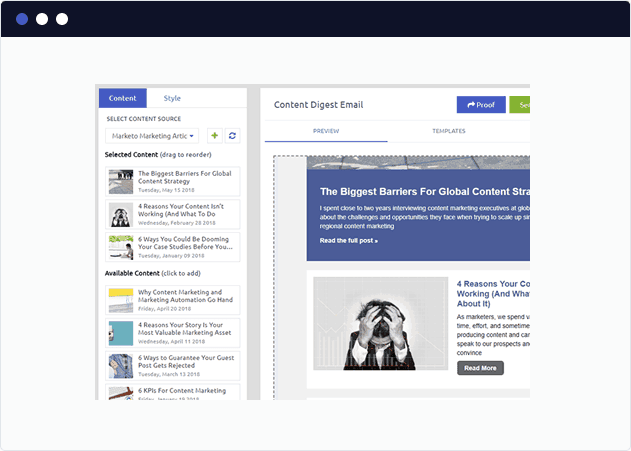 Our drag-and-drop curated email newsletter builder allows you to craft the perfect mix of content in a matter of minutes. Sound easy enough? Create your first curated email newsletter today. What is a curated email newsletter? A curated email newsletter is one that aggregates interesting and/or popular content around a specific subject. Curated newsletters find the best of the best material, and then pull it together in one place. Often times, along with links to the contents’ external locations, the newsletter will offer a brief comment or summary about the pieces as well. 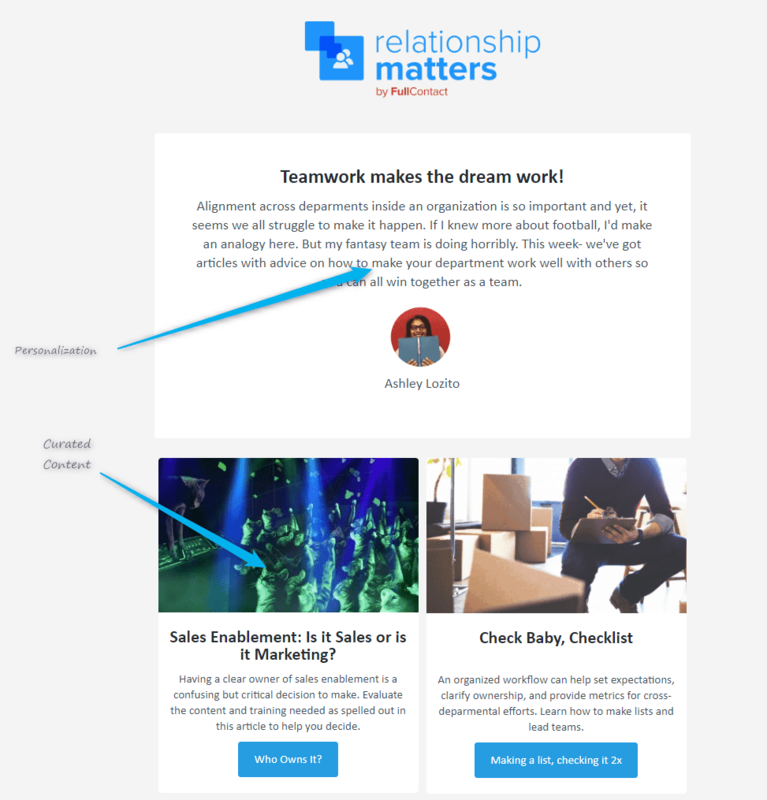 Curated newsletters are a chance for you to offer readers a vast variety of material you’ve hand selected for them. And with so much content being published on the web, a curated newsletter has serious value. Audience — The value for your subscriber audience is having the best content around a particular subject selected and sent directly to them. This means the topic and content needs to be aligned with your audience’s expectations and interests. 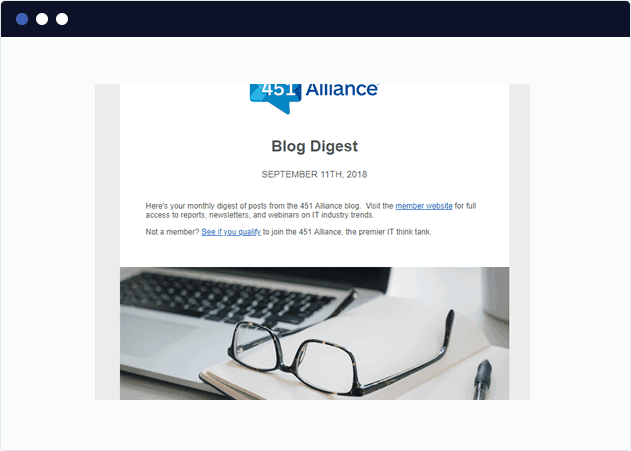 Business Alignment — The goal of creating a curated newsletter is to keep your business top of mind and establish your brand as a thought-leader. For this reason it is important to ensure your content relates to your brand and the products you are selling. Finding the balance between these two items is where you will find the right topic for your newsletter. Finding trustworthy and high-quality content sources is one of the most important tasks associated with creating a curated newsletter. You’ll likely need to read a lot of content about your chosen topic in order to find the best stuff for your subscribers, so it’ll help to setup some basic systems to ensure this is as quick and easy as possible. Rather than spending hours manually browsing different sources, use tools like Feedly and Flipboard to help bring all that content together in one place. These tools will pull all of your favorite sources into a customized magazine-style layout which makes it really easy to browse articles and find interesting content. When you find something you want to include in your curated newsletter, you can use tools like Evernote or Pocket to save them for later so it’s ready to go when you’re creating and sending your newsletter. If you are a FeedOtter customer you can use the curated campaigns feature to drag-and-drop content from any website or rss, social, YouTube, Twitter, or Instagram feed directly into your email design. FeedOtter also includes lots of great curated newsletter templates to make designing your first newsletter a quick and easy process. With your email designed and created it’s time to send your first curated email newsletter to your subscribers. If you’re a FeedOtter customer, you can select one of our email integrations and schedule your curated email to send from Marketo, Pardot, Eloqua, or MailChimp directly. This is ideal since all open, click, and unsubscribe tracking stays in your existing email system. Outside of FeedOtter you will need to copy your email HTML into your email sending software ensure all the links and unsubscribe functions are working perfectly. In either case we using an email testing tool such as Litmus to ensure your email looks great. Once you’ve tested your newsletter, you’re ready to hit send on your first curated email newsletter!